The NEX-F3 succeeds the NEX-C3 while keeping the latter’s 16Mpix APS-C CMOS Exmor sensor, well-known for its qualities of excellent behavior at high sensitivities and in low-light, and for its record-breaking dynamic range. Compared to the NEX-C3, the NEX-F3 breaks through the previous limits of video resolution, offering Full HD recording at 50i/25p with stereo sound via an integrated microphone, along with permanent autofocus. Still highly compact, the NEX-F3 measures a few millimeters more than its predecessor in all dimensions, notably depth (41,3mm vs 33mm). It also puts 25 more grams on the scale, but still weighs only 255 grams. Its slightly-increased heaviness lets the NEX-F3 offer a somewhat more generous measure of autonomy, allowing 470 shots— a gain of some 70 images over its predecessor. The Sony NEX-F3 also retains the beautiful 3″ / 921,000-point tiltable Sony XtraFine LCDscreen and an integrated flash — a small detail that makes this camera much more versatile than the flash-deprived NEX-5N. Fast autofocus having become all the rage in 2012, the NEX-F3 adopts a speedy autofocus such as one finds with other recent NEX cameras and such 2012 compact offerings as the Sony HX20V. The NEX-F3 offers the entire battery of advanced modes that Sony has perfected over the last few years, such as Sweep Panorama mode in 2D and 3D that can go up to 23Mpix, and HDR mode — a true HDR mode that utilizes the data of 3 bracketed shots, whereas many other cameras content themselves with simply stretching the tones of the same single photo. Eleven creative effects are on the NEX-F3 menu: partial color, pop color, soft high-key, posterization, high-contrast monochrome, pinhole, retro photo, soft focus, HDR painting, rich-tone monochrome, miniature. In addition to HDR mode, the NEX-F3 can be set to offer more- or less-extensive dynamic range with the D-Range Optimizer, protecting the highlights and boosting the shadows. Like its SLT digital reflex twin, the Sony A37, the NEX-F3 has an embedded “intelligent” digital focal length doubler that extrapolates the final version of the image and limits the damage done by cropping through use of By Pixel technology. This technology is also used to offer automatic cropping of photos shot in portrait mode: the camera detects faces and their position relative to the shot as a whole, and recomposes the image by taking into account the famous Rule of Thirds. 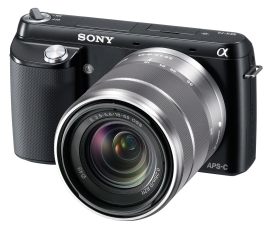 Sony has announced the release of the NEX-F3 in June at a retail price of 600 euros, which includes a black & silver 18–55mm lens. A double kit will also be available: NEX-F3 + 16m f/2.8 pancake lens + 18–55mm zoom lens for the price of 700 euros.